THE LAST TO ARRIVE? It is likely that in most of our households the nativity crèche and figurines of the first Christmas story are by now packed away with all the other Christmas decorations. But in some ancient Christian traditions, today would be the day that the figures of three wise men, or Magi, would finally be placed at the nativity scene. Their arrival completes the entourage of people who are drawn to the Christ child. In the fullness of Christmastide and in the light of the star, the journey to adoration of the Christ child is nearly complete. FROM BEYOND THE REALM. The arrival of these mystery people from some distant place signals something new that has forever broadened, opened, and heightened the trajectory of grace. The trajectory of grace now emphatically includes Gentiles—all those not heretofore considered a part of the story of salvation. The advent of the Messiah, spoken of in Old Testament prophecies (like Isaiah 60) and in the Magi being led by a star to Bethlehem, signals that something long hoped-for and anticipated has come to be: the promise of grace and the way of grace is open and inclusive. From this day forward, "whosoever will" may come. IT WON'T BE COMPLETE WITHOUT YOU. 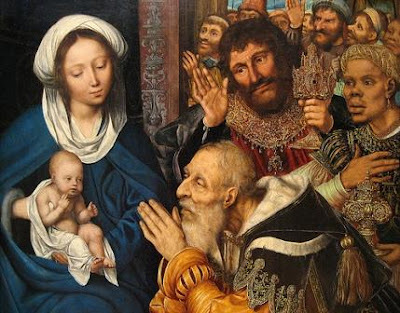 I wrote earlier that the journey to adoration of the Christ child is nearly complete. Nearly. It is as nearly complete as our own adoration. Have you made the journey in your heart? Place yourself among the unlikely figures who hear the Good News or who have been drawn by some light. You are no less out of place than anyone else. I am no more worthy of being there than the next person. But have we been drawn? If so, then let us do the only thing one can do in the presence of divinity, in the presence of unparalleled royalty—let us be silent, let us be grateful, let us bow down in worship and adoration, let us prepare ourselves to be forever changed, let us be still and know that God is God. Let us be amazed at grace. And let us turn it inside out in a lifetime of bearing grace to all who are drawn to His light. Christ, to Thee, our heav’nly King. A BENEDICTION FOR EPIPHANY. May your journey ever lead you to the wonder of the Christ child. May God’s light ever draw you, guide you, comfort you, challenge you, send you. May grace guide you from morning to evening, day by day, until, at last, either His Kingdom has come or you have come into His Kingdom. Amen.